Snowgo: Don't eat yellow snow! Alternatively, write your own message with this nifty tool called simply: pee. Hannah, I don't know what you mean by that. 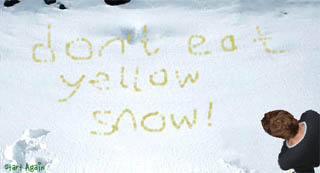 Surely nobody could learn not to eat yellow snow the hard way?